Bananas are a yummy, healthy, easy-to-eat, cheap fruit that we all haven't appreciated enough in our lives. Therefore, a day is dedicated to celebrating the potassium-rich fruit. Every year on the 17th of April World Banana Day is celebrated to remind you of the importance of the yellow fruit. Banana is such a fantastic fruit that can be both eaten raw and ripened. The banana plant itself is beneficial, right from the leaves to the stem to the flower and of course the fruit, everything can be utilised in some way of the other. The fruit is indeed a blessing to us. On the run? Have a banana! Constipated? Eat a banana? Hungry and want something scrumptious? Banana is what must go for. Not only that, in the humour and meme world, banana have forever played an essential role in making us laugh. 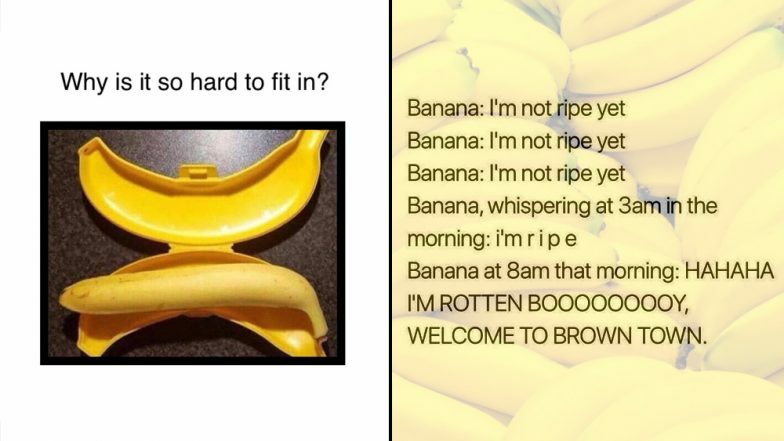 Be is the dirty NSFW memes, or some really cute- bananas are the best. Green Banana Benefits: 5 Reasons Why You Should Include Raw Bananas In Your Diet. Here are some of the classic banana memes that will make you LOL! I don't know why bananas do this to us? Could you dab as cool as this banana? This World banana day let's appreciate bananas even more in our lives and also laugh out more for a healthy body and a healthy mind.